It’s always fun when you can go back to shows you used to watch as a kid and relieve those memories. I used to watch Rugrats on the reg, so when I found this episode on Youtube, I fired it up and was happy to do so. Rugrats always had a clever way of interpreting the world through the eyes of babies and it’s an interesting take on Christmas that comes through because of it. I think most people are more familiar with the episode surrounding Hanukah than this one; truthfully, I do remember this one all that well, but it’s a pretty good episode. The story has basically two main parts: Chucky’s fear of Santa and Angelica trying to undo her recent misdeeds. Both should come as no surprise because you can probably sum up most episodes that way. Chucky’s storyline sort of goes nowhere, except by the end, he’s not so afraid of Santa Claus when he shows up with toys. I like the Angelica storyline, as it references O. Henry’s “The Gift of the Magi”. In short, Angelica devises a plan to ruin Phil and Lil’s Christmas by trading with them. Phil gives up his Reptar doll to give Lil a box of crayons while Lil gives up her coloring book so that she could give Phil a space helmet for his Reptar. When Angelica finds out that Santa gives out lumps of coal to naughty children when they’ve been bad, she attempts to reverse her plan in time to get back in the jolly man’s good graces. 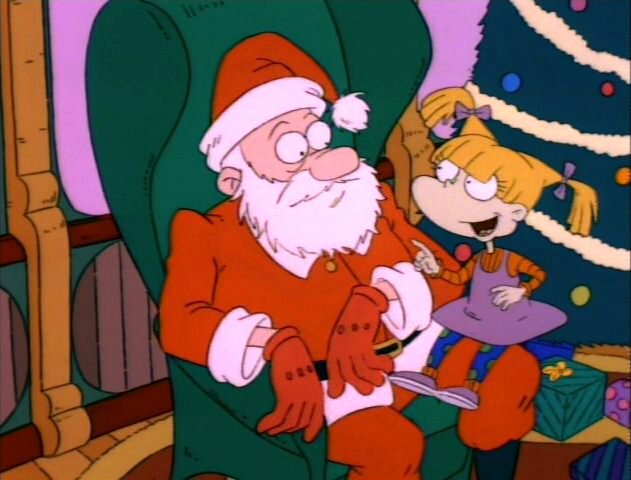 Rugrats has a special place in a generation’s heart and their holiday episodes are always a fun watch. This one still holds up, even if it wasn’t exactly the most memorable of their takes on a holiday.